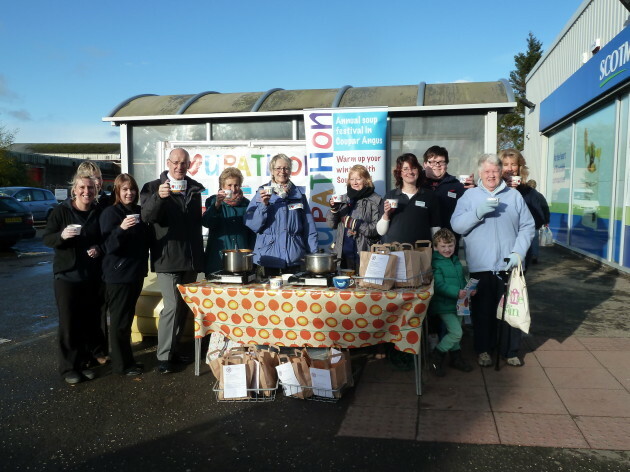 Shoppers from Scotmid Coupar Angus enjoy some soup with Wendy McCombes, Soupathon organiser and Perthshire MSP John Swinney. "Scotmid have been very generous once again this year by sponsoring our soup festival." A soup festival that encourages Perthshire residents to make and enjoy homemade soup has received support from Scotmid for the second year. The Coupar Angus Soupathon runs throughout the month of November, with soup making workshops and cooking lessons for children and families. A key part of the festival is also about raising awareness of how easy and healthy soup is to make. The festival culminates in a championship to find the region’s best soup, with prizes for the best soup made by a child aged under 13 and the best soup using local ingredients among the accolades that are up for grabs. Scotmid is supporting the Soupathon by supplying prizes for the championship and the posters and flyers to promote the festival and teach residents how to make soup.